Phoenix-Tempe, Arizona Bartending School - The Bartending Academy of Tempe, Arizona. 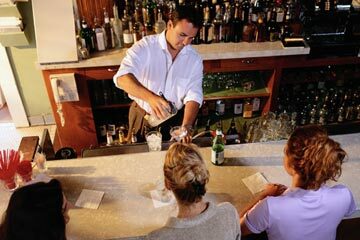 The Bartending Academy employs instructors who have years of succesful experience in our industry. Each Instructor uses the Professional Bartending Schools of America Instructors manual when teaching class. This ensures that each student receives consistent training from class to class. The instructor adds tips and tricks from their experience base and adds their own personality to their teaching. Classes are fun and informative. The Morning class is is held Monday through Friday from 9am to 1pm. The Afternoon class is is held Monday through Friday from 1:30pm to 5:30pm. The Evening class is is held Monday through Friday from 6pm to 10pm. Classes are scheduled the last two weeks of the month. Course availability is dependent on enrollment. Second week is held Tuesday and Wednesday from 6pm to 10pm. This class is required prior to attending the Alcohol Awareness Management Class. Classes are scheduled each Friday of the month. This Alcohol Awareness Basics class is required prior to attending the Alcohol Awareness Management Class. Clases are scheduled for the last weekend of each month. Held Saturdays from 11am to 4:15pm..